Is an operation the right treatment for a slipped disc? How can I eliminate bad posture, the main cause of back pain? How does bad posture cause back pain? Are armrests useful in preventing back pain? 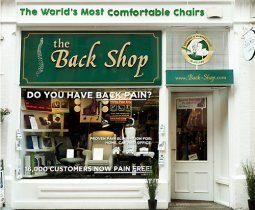 Can you guarantee that your chairs will resolve my back pain? Customer: Can you guarantee that your chairs will resolve my back pain? C.C. (Colm Campbell): No. I can’t guarantee anything…. Should I use a footrest? Customer: Can a footrest improve my posture? C.C. (Colm Campbell): The height of the average desk is around 27 inches…. Should you always sit with your knees way above your hips? Many cars are like this. I get a lot of pain when driving. Do you do anything for car seats? Customer: I get a lot of pain when driving. Do you do anything for car seats? C.C. (Colm Campbell): Yes….